By Jay L. Zagorsky Published on Jun 13, 2017. Our recently published research examined this assumption by looking at who eats fast food using a large sample of random Americans. What we found surprised us: Poor people were actually less likely to eat fast food – and do so less frequently – than those in the middle class, and only a little more likely than the rich. In other words, the guilty pleasure of enjoying a McDonalds hamburger, Kentucky Fried Chicken popcorn nuggets or Taco Bell burrito is shared across the income spectrum, from rich to poor, with an overwhelming majority of every group reporting having indulged at least once over a nonconsecutive three-week period. There are rich and famous people, including President Donald Trump, who are also famous for their love of fast food. Trump even made a commercial for McDonalds in 2002 extolling the virtues of their hamburgers. 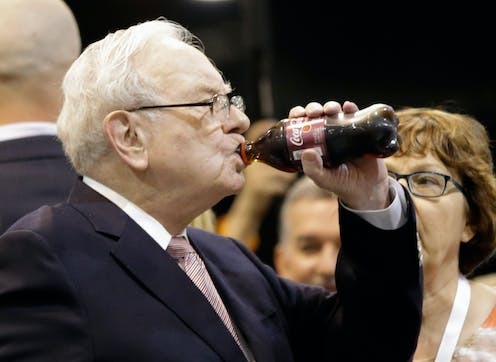 Warren Buffett, one of the world’s richest people, says he “eats like a 6-year-old,” meaning lots of oreos and Cokes every day (he invests like one too). Overall, 79 percent of respondents said they ate fast food at least once during the three weeks. Breaking it down by income deciles (groups of 10% of aggregate household income) did not show big differences. Among the highest 10th of earners, about 75 percent reported eating fast food at least once in the period, compared with 81 percent for the poorest. Earners in the middle were the biggest fans of fast food, at about 85 percent. The data also show middle earners are more likely to eat fast food frequently, averaging a little over 4 meals during the three weeks, compared with 3 for the richest and 3.7 for the poorest. Research suggests this ban did not work since obesity rates went up after the ban compared to other neighborhoods where fast food had no restrictions. This seems to poor cold water on other efforts to solve obesity problems by regulating the location of fast-food restaurants. The typical cost per meal at a fast-food restaurant – which the Census calls limited service – is over US$8 based on the average of all limited service places. Fast food is cheap only in comparison to eating in a full-service restaurant, with the average cost totals about US$15 on average. Moreover, $8 is a lot for a family living under the U.S. poverty, which for a family of two is a bit above $16,000, or about $44 per day. It is doubtful a poor family of two would be able to regularly spend more than a third of its daily income eating fast food. If politicians really want to improve the health of the poor, limiting fast food restaurants in low-income neighborhoods is probably not the way to go. We found that people who said they checked ingredients before eating new foods had lower fast food intake. This suggests that making it easier for Americans to learn what is in their food could help sway consumers away from fast food and toward healthier eating options. Another finding was that working more hours raises fast food consumption, regardless of income level. People eat it because it’s fast and convenient. This suggests policies that make nutritious foods more readily available, quickly, could help offset the lure of fast food. For example, reducing the red tape for approving food trucks that serve meals containing fresh fruits and vegetables could promote healthier, convenient eating. Our goal is not to be fast food cheerleaders. We do not doubt that a diet high in fast food is unhealthy. We just doubt, based on our data, that the poor eat fast food more than anyone else.